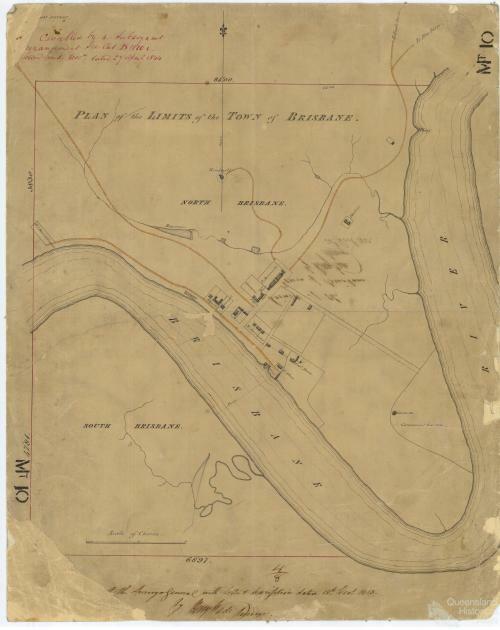 Plan of the limits of the Town of Brisbane (1843) | There once was a creek . . . Originally established as a penal colony in 1824, Brisbane was opened to free settlement in 1842. This ‘Plan of the limits of the Town of Brisbane’ shows the extent of what must have existed in Brisbane at around that time. The original is held by the Queensland State Archives, and you can explore the digitised version via the Queensland Historical Atlas. In addition to the few buildings and roads marked on the map, there are also some fascinating natural features. For example, notice the creek that begins up in Spring Hill and flows down towards a small dam which is right on top of where the new law courts are today. This was Brisbane’s first water supply. The stream continues through a small pool at King George Square and flows to the river near Creek Street. Across the river, nothing is marked in South Brisbane except for a creek that winds through the Convention Centre and Southbank Parklands (where there are now artificial streams). You can explore this map in the standalone version of Google Earth by opening (or downloading and then opening) this file. Great work! Love the kmz files with historical mapping superimposed on Goggle Earth satellite imagery.